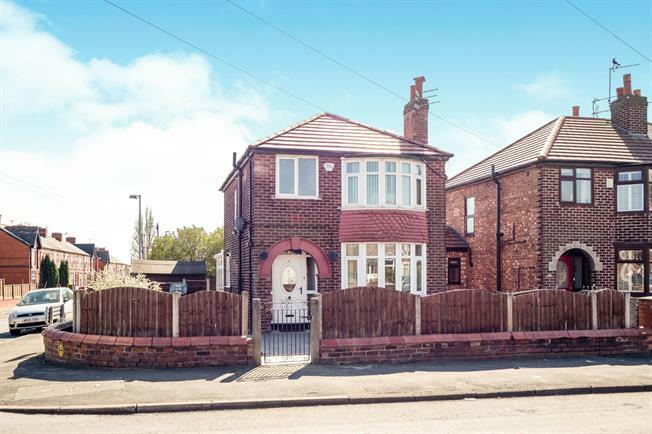 3 Bedroom Detached House For Sale in Manchester for Asking Price £220,000. This well maintained detached property offers fantastic size rooms throughout, with a fantastic conservatory at the rear running the full width of the property. Featuring an entrance hall, spacious lounge which opens into a separate dining room, fitted kitchen and the excellent size conservatory. To the first floor are three well proportioned bedrooms and a fitted bathroom suite. Externally, the property is situated on an impressive corner plot with patterned concrete to three sides providing low maintenance outside space. There is potential for off road parking to both the side and front. Further benefitting from gas central heating and double glazed windows throughout, viewings are highly recommended! UPVC front double glazed door. Double glazed uPVC window with obscure glass facing the front. Radiator, carpeted flooring, built-in storage cupboard. Double glazed uPVC bay window facing the front. Radiator and gas fire, carpeted flooring. Open access to the dining room. UPVC sliding double glazed door to the conservatory. Radiator, carpeted flooring. UPVC French double glazed door, opening onto the garden. Triple aspect double glazed uPVC windows facing the rear and side overlooking the garden. Radiator, tiled flooring. Double glazed uPVC window facing the side. Vinyl flooring, boiler, tiled walls. Granite effect work surface, wall and base units, stainless steel sink with mixer tap and drainer, freestanding oven, space for washing machine and fridge/freezer. Loft access . Double glazed uPVC window with obscure glass facing the side. Carpeted flooring. Double bedroom; double glazed uPVC bay window facing the front. Radiator, carpeted flooring, fitted wardrobes. Double bedroom; double glazed uPVC window facing the rear overlooking the garden. Radiator, carpeted flooring, fitted wardrobes. Single bedroom; double glazed uPVC window facing the rear overlooking the garden. Radiator, carpeted flooring. Double glazed uPVC window with obscure glass facing the front. Radiator, tiled flooring, built-in storage cupboard, tiled walls. Low level WC, panelled bath, shower over bath, pedestal sink.